"It is time for our economy in this area to take off and what we are doing here today as a result of the action of the legislature during this last session is going to help build a very thriving economy that we already have and take it to the next level." 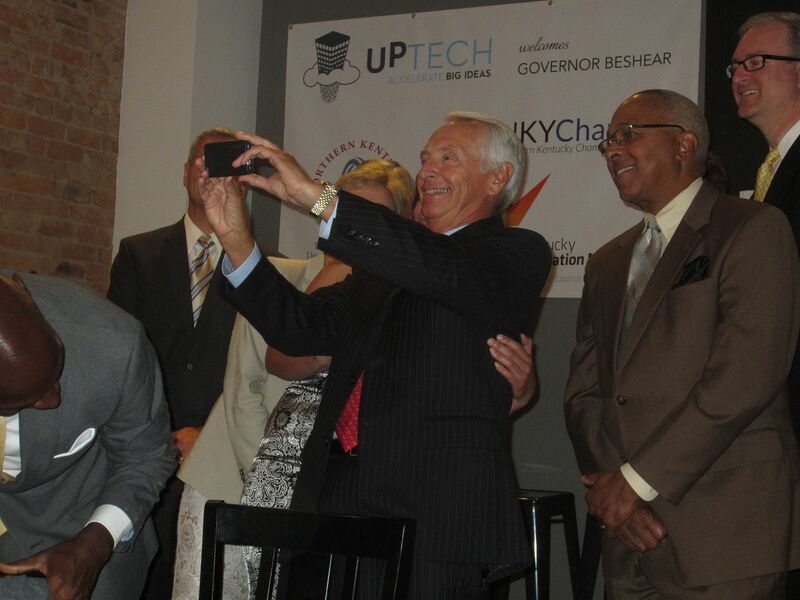 Governor Steve Beshear toured Covington's UpTech, the start-up business accelerator currently selecting its third class of news businesses to receive early stage funding and business support, before ceremonially signing into law House Bill 445, which includes an angel investment individual tax credit. Kentucky lacked that capital raising advantage but Ohio had it, making the Northern Kentucky region particularly vulnerable to losing promising new businesses like the ones born at UpTech. In the new economy, Beshear said, small businesses will be the focus. "People think only about what we would call home runs, bringing a huge manufacturing company in, investing millions of dollars, and thousands of jobs," he said. "While we have had our share of those kinds of projects in Kentucky, we also know that most new jobs and the excitement that comes with them come in small packages." The new legislation allows individuals to receive a tax credit of up to 40% of an investment in an entrepreneur and 50% credits in counties with higher unemployment. Out of state investors are also eligible because they can sell their tax credits to Kentuckians, Beshear said. Beshear came to Covington for the ceremonial signing because while HB 445 will benefit the whole Commonwealth, it was Nothern Kentucky's legislators, Chamber of Commerce, rank and file citizens who championed its passage for five years. 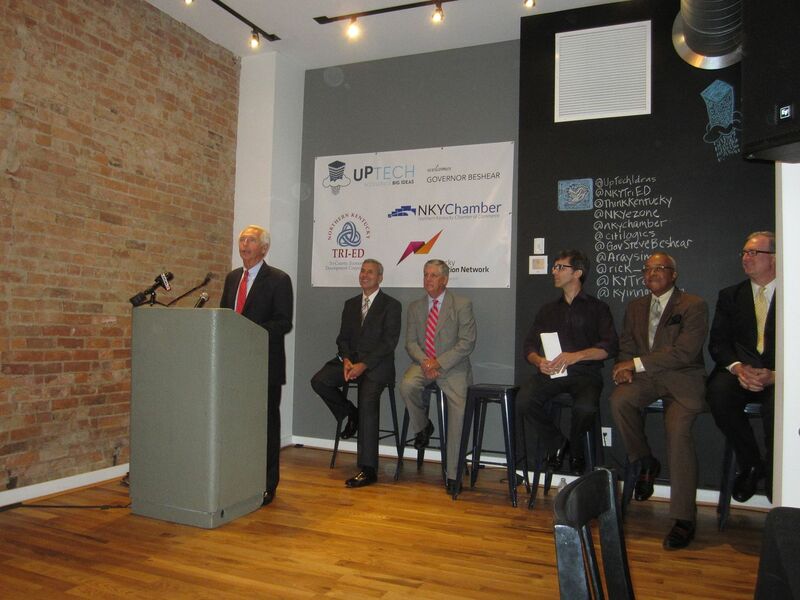 "I picked this site for a number of reasons," Beshear said at UpTech's swanky new digs on Pike Street where the noise from new apartments being installed above filtered into the news conference. "As a small business incubator in Covington, UpTech is one of those places creating a new culture of innovation in our Bluegrass State. Northern Kentucky has been the focal point for entrepreneurship in our new economy thanks to places like the eZone." In fact, it was Casey Barach, director of the Northern Kentucky eZone who first sparked the discussion about angel investor tax credits when he started to research ways to increase capital resources in the state. In 2010 he wrote the white paper on the benefits to Kentucky's economy that would result from an angel investor program. "It's a big day for me," Barach said. "Let's not forget what we're celebrating here. It is a job creation bill, supporting job creation from the ground up." Barach cited multiple reasons that the region is just as Beshear said, the focal point of entrepreneurship and innovation in the Commonwealth. With Northern Kentucky University's new College of Informatics and its impressive Griffin Hall, the campus also boasts one of the world's top five student supported business incubators. And with the new credit, the region's efforts will only be stronger, he said. UpTech has graduated 23 start-ups, companies that would benefit even more from the credits. "Kentucky will have the most aggressive tax credit program for early stage angel investing in the country," Barach said. Jim Uber knows how UpTech and angel investors can benefit a company. He and two other engineers founded CitiLogics, a water research firm, revolutionizing municipal water systems. The company was part of UpTech's first class. "Our hope is someday soon that Kentucky will be known as the epicenter of smart water, delivered fresh and efficiently for all future generations," Uber said. The path to the tax credit bill was long. State Rep. Rick Rand (D-Bedford) accompanied the governor to Covington and said that he and State Senator Katie Stine (R-Ft. Thomas) did not agree that the state could afford it until a meeting drifted towards 3 a.m. on a Sunday. State Rep. Arnold Simpson (D-Covington) was a champion for the bill during the past couple sessions of the General Assembly. "Perseverance is the key," he said. Simpson called the bill an positive example of a public-private partnership. "It's vital for we who serve in the public sector to listen to those who work in the private sector to embrace concepts that are going to bring about jobs and opportunities." The Northern Kentucky Chamber of Commerce pushed for the legislation, too, and its new president, former Secretary of State Trey Grayson, who just assumed the role after returning from a gig leading the Institute of Politics at Harvard University, said that he could look out his previous office and see the room where Mark Zuckerberg created Facebook at the Massachusetts campus. "You could see what a start-up meant to that Commonwealth," he said of Massachusetts. "Combine this with what is happening at NKU and this is a really exciting time in Northern Kentucky and I can't think of a better place to begin the next chapter of my professional career."